Worldwide 50 Gold Award Hits Vol. 1 is a compilation box set by Elvis Presley. The four-album set was released in August, 1970, as his 38th album. The set peaked at number 45 on the Billboard 200 and at number 25 on the country chart. It was certified Gold on February 13, 1973, Platinum on March 27, 1992 and 2x Platinum on June 17, 1992 by the Recording Industry Association of America. Of the 51 tracks featured, four make their album debut in this collection: "Viva Las Vegas", "Suspicious Minds", "Don't Cry Daddy", and "Kentucky Rain". 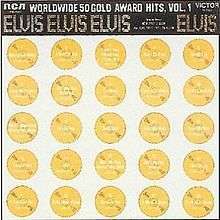 ↑ "Elvis' 50 Worldwide Gold Award Hits, Vol. 1". Allmusic. Rovi Corp. 2013. Retrieved May 25, 2013. ↑ "Searchable database". RIAA. Recording Industry Association of America. 2013. Retrieved May 25, 2013. Note: Enter search for "Worldwide 50 Gold Award Hits, Volume 1"